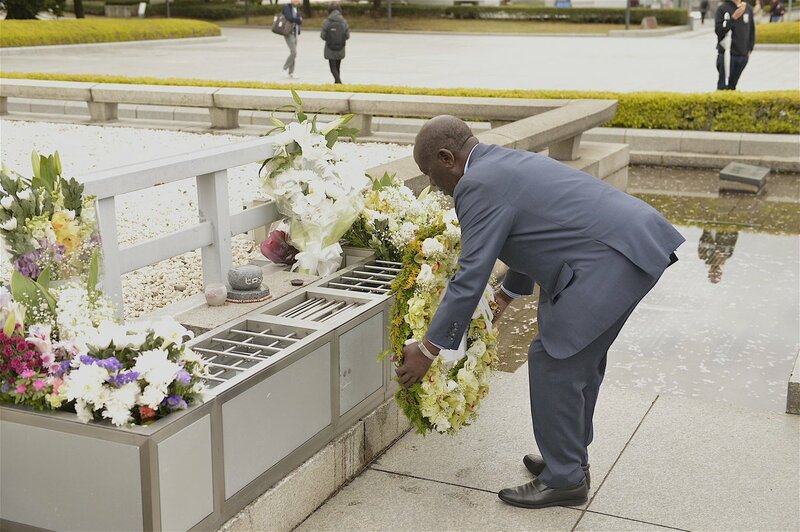 TOKYO – The Vice President Edward Kiwanuka Ssekandi who is leading the African delegation to the fifth Buddhist International peace summit in the port city of Osaka Japan has called for dialogue as the surest way of ending the conflict, especially in the developing countries. The Vice President who was speaking to the Japanese media after a guided tour of a new Buddhist training facility below Mount Mikasa in Hyogo prefecture said part of the world conflicts are as a result socio-economic and political injustices and called for protection of the vulnerable especially women children and the elderly. Mr. Ssekandi said that world peace can only be achieved when humans cease blaming each other for mistakes of the past and begin working together for a common better future without attempts of manipulation and exploitation of those with limited knowledge or tools to guard against such tendencies. He said that Uganda has taken such a step to contribute to world peace by ensuring the safety and security of the great lakes region saying although it has been with a price tag fighting against armed militias in Somalia and other neighboring countries and organised crime at home, Uganda is committed to ensuring that peace prevails in the region.